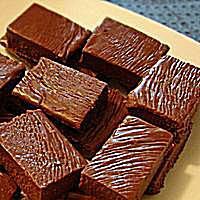 There are hundreds of recipes for chocolate fudge, most requiring a candy thermometer and a good bit of finesse to achieve that rich, creamy-smooth texture, but this recipe from Carnation Evaporated Milk does not. All you do is simply boil, turn off the heat, stir, chill, and cut! 1. Combine evaporated milk, sugar, butter, and salt in a medium, heavy-bottomed saucepan. Place over medium heat and bring to a full boil while stirring constantly. Cook, stirring for 5 minutes. Remove from heat. 2. Stir in chocolate chips, mini marshmallows, and vanilla. Keep stirring until chocolate and marshmallows are melted. Pour into a plastic wrap or foil-lined 8-inch baking pan. Chill for 2 hours, or until firm. • For nutty fudge, stir in 1/2 cup chopped almonds, pecans or walnuts when the chocolate is melted. Chill as directed.